According to NIST (National Institute of Standards and Technology) cloud computing is a model for enabling convenient, on-demand network access to a shared pool of configurable com putting resources (e.g. networks, servers, storage, application and services) that can be rapidly provisioned and released with minimal management effort or service provider interaction. Cloud computing is expected to be a “$160 billion addressable market opportunity, including $95billion in business and productivity, and another $65 billion in online advertising”. Another research by Morgan Stanley has identified that it is one of the prominent technology trends. As the IT industry is shifting towards platform as a services and software as a service for customers therefore there will be an increase in the number of cloud platforms available. Several academic and industrial organizations already start investing in technology and infrastructure for cloud computing. Content Delivery Network providers place web server clusters across the globe in order to improve the response time and find the location of replicated contents which is hosted for the end users. 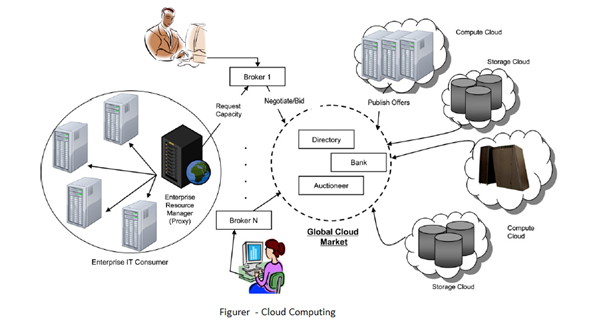 Here we discuss the architecture, business model and the types of cloud computing in detail. Generally cloud computing architecture is divided into four layers and they are hardware layer, infrastructure, platform and application layer. Hardware layer is responsible for the physical resources of the cloud computing such as servers, routers, switches etc. This layer is implemented in data centre which contains many servers, organized in racks and interconnected via switches, routers and wires. 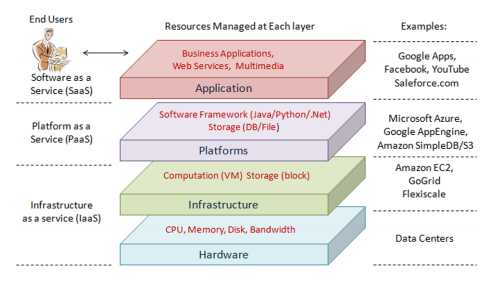 Platform Layer, it consists of operating systems and application framework. The idea behind platform layer is to reduce the burden of deploying application directly on VM containers. Application Layer, it consists of cloud application. Cloud applications are different from the traditional applications as it can control the automatic scaling feature to achieve better performance, availability and reduce the operating cost. Clouds provide services at three different levels (IaaS, Paas and Saas). It deliver software which is remotely accessible by user via internet. E.g SAP, Rackspace, Salesforce.com etc. Here the service provider offer highest degree of control over data, performance and security. It is more flexible approach and is a combination of both public and private clouds which try to overcome the limitations of both models. Her some part of service infrastructure runs over private clouds while the other runs on public clouds.